The catcher gets to wear the cool mask. They get the massive glove. They get the chest protector and the knee pads. 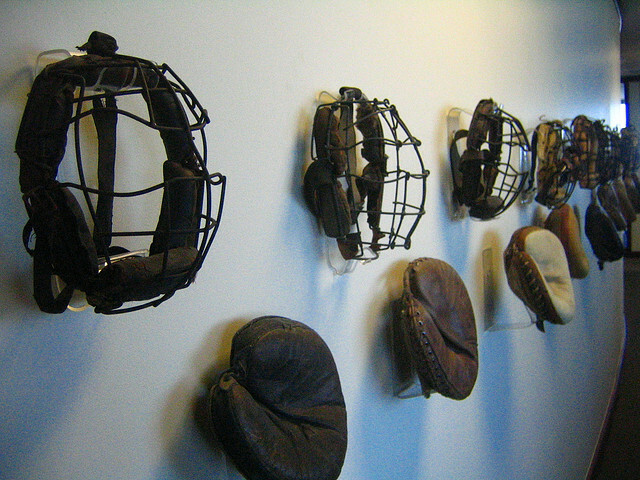 They’re basically coated in armor — that’s the primal reaction of any youngster drawn to the catcher’s position. That’s why some players opt for the all-out suffering that is kneeling behind home base for half of every inning for the entire game. And, also, because the catcher is the first and last line of defense — they’re the target of the pitch that starts the play, and they’re the player charged with getting outs at the only spot on the entire field where points can be scored. This makes a catcher’s contribution to a team is very easy to see but mildly difficult to quantify with sabermetrics, or advanced metrics, if you prefer. The same problem as the famous hurdle of early computing, explaining to a machine the difference between a ‘B’ and an ’8?. It’s so obvious when you look at it, but it’s tricky to describe in print. So what we’ve done, in an attempt to quantify which catchers are the most saber-friendly (and should be, by extension, the most fun to watch) is to combine each catcher’s rSB and RPP for their defensive rating, and added that to their batting WAR for offense. Don’t worry, we’re about to explain what those acronyms mean. All metrics pulled from FanGraphs. So, Matt Wieters, the 27-year-old catcher for the Orioles, scored a 7.3 Total Catcher Score based on his play last year. Let’s take a look at why. First, his rSB. The rSB, which stands for stolen base runs saved, or “how many ‘runs’ a catcher contributes to their team by throwing out runners and preventing runners from attempting steals in the first place.” (definition via Fangraphs) It was originally coined by the Fielding Bible and is based around zero. The higher the number, the better the stat — and, if it’s real bad, negative numbers are possible. The second half of the defensive equation, RPP “calculates the number of runs above/below average a catcher is at blocking pitches.” (definition, again, via Fangraphs) It’s the brainchild of Bojan Koprivika, who first discussed it on The Hardball Times. Again, this is a score based around zero — so above zero is good, and below zero is bad. FanGraphs generally weighs out the tiers of rSB and RPP as 5+ is excellent, 3 is great, 1 is above average, and the inverse for the negative numbers — bad, worse, and awful. So, on the defensive end of the equation, Matt Wieters is well above-average at throwing out runners and making saves; he’s great at blocking pitches, and, on offense, he’s bringing 2.2 Wins Above Replacement to the batting box, for a grand total catcher’s score of 7.3. 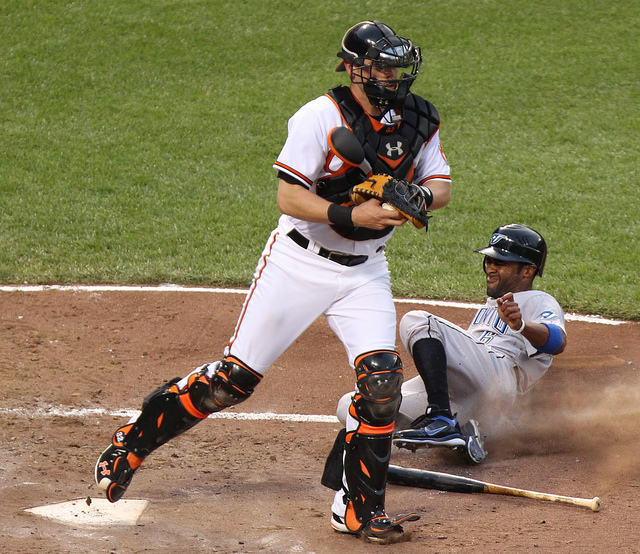 Good job, Matt Wieters, and thanks for being such a willing demo subject. So Joe Mauer is quite the offensive monster. The 2013 All-Star and Silver Slugger brings a staggering 5.2 WAR to the table in his quest for Saber-dominance, which is quite impressive. Also, in case “Wins against Replacement” isn’t super clear — imagine that Joe Mauer got stuck in traffic and missed a game. How much would the Twins suffer if they had to bring in Joe Average, the faceless, nameless MLB hitter? 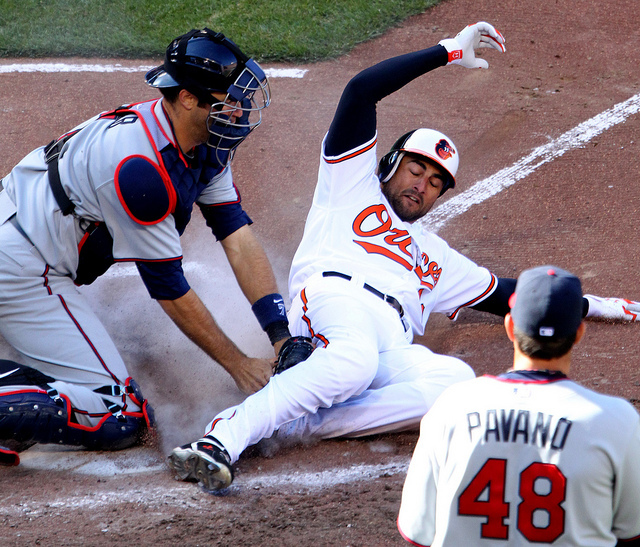 Missing Joe Mauer’s 5.2 WAR hurts a lot more than Missing Matt Wieter’s 2.2 (sorry, Matt). Similarly, the WAR can be broken down into informal tiers (again, courtesy of the invaluable FanGraphs) — 0-1 is a scrub, 6+ is an MVP, and all the shades in the middle are in between. Keep in mind, though, that the chart is detailing total WAR, instead of just offensive WAR — which is what we’re using. Is Joe Maur a superstar on offense? Well, he hit 11 home runs last year on a .324 batting average. We’ve got some of his 2013 highlights below, so you tell us. On the defensive end, Mauer ranks as a great run saver and an above-average pitch blocker, but the real bonus to watching Joe Mauer is when he steps up to the plate. So here’s an interesting situation: Two of our saber-friendly catchers wound up with an identical TCS, even though they’re noticeably different players. 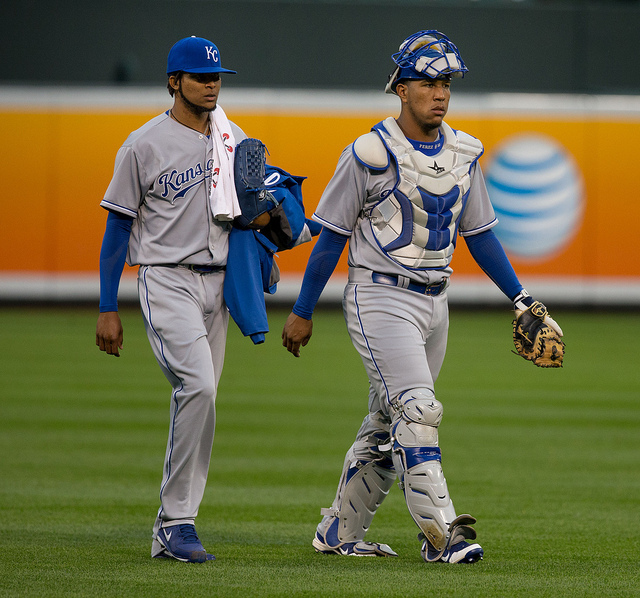 Perez, who’s been with the Royals since 2006 but made his MLB debut in 2011, made All-Star and Golden Gloves appearances in 2013, and it’s easy to see why. He’s an excellent run saver, a solid pitch blocker, and a good offensive presence. Playing for more than 100 games for the first time last season, Perez should be an integral part of the Royals’ push to make it into the playoffs for the first time since 1986. Did you know that Yadier Molina can really hit a baseball? It’s true. 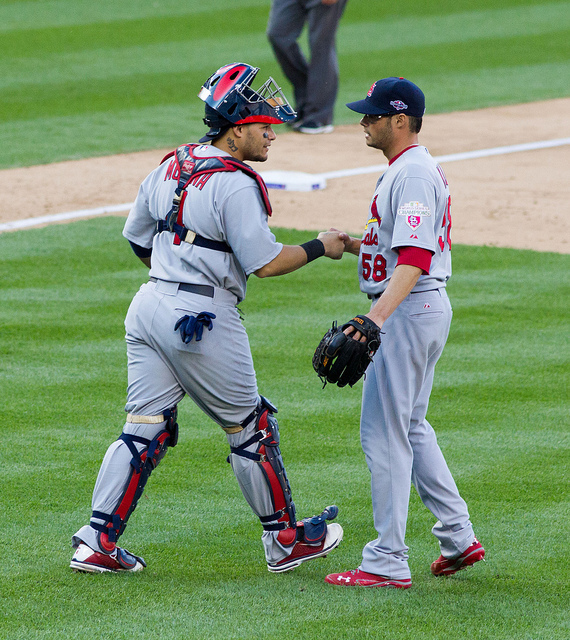 After a 2012 campaign that saw the Cardinals catcher run off 22 home runs, Molina settled down to earth in 2013, hitting a mere 12 in 136 games. That’s not the only part of Molina’s game that’s Played The Right Way, though, as he comes in as the MLB’s best pitch blocker by a large margin. The 5.9 is a whole 1.4 ahead of the next closest catcher, and places Molina firmly and securely as one of the best defensive catchers in the game — even if he’s merely all right-to-good when it comes to saving stolen bases. The Cardinals made it all the way to the World Series last season, and Molina’s strong play throughout the postseason was a big contributing factor to St. Louis’ continued success. With the Cards getting ready to repeat their deep playoff run in 2014, Molina’s going to have to continue playing like this if they want to hang another World Series banner up in Busch Stadium. Even Molina’s got nothing on Russell Martin, though. Martin, who does, definitely, play for the Pirates (even though he’s pictured above in a Yankees uniform because action shots are awesome), puts up a stat line that makes the whole enchilada seem like a joke. An rSB of 9? Yeah, maybe if he only played five minutes, right? Like the time Rasheed Wallace unretired and wound up leading the league in PER? Wrong. That stat was born out of more than 1,000 innings played in 2013. Russell Martin is a beast. Martin, who moved from the Yankees to the Pirates just before the 2013 season began, showed the league he still had it, even at the age of 31. While the three-time All-Star didn’t add another award to his total that year, he did help the Pirates back into the playoffs for the first time in more than twenty years. So Martin’s a great hitter, an awesome pitch blocker, and the best in the league at saving stolen runs. What else is there to say? The numbers love him. The Pirates love him. Viva Russell Martin! Offensive and defensive metrics can be found, and toyed with, here.